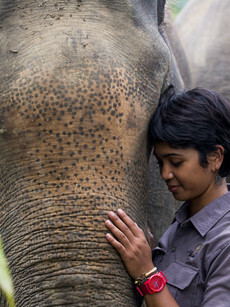 Farwiza Farhan is Acehnese conservationist working to protect the Leuser Ecosystem in Sumatra, Indonesia. Leuser Ecosystem is the last place on earth where rhino, elephant, tiger and orangutan still roam together in the wild. Although designated as an area for protection, the threats to the Leuser Ecosystem continue to escalate every year. Farwiza work to connect and empower the local community to have their participation accounted for in decision making over their land. Farwiza initiates legal challenge against government and companies in order to have Leuser's protection acknowledged and recognised in spatial planning development. She focuses her efforts on policy and advocacy element, starting from building grass-roots movements, equipping the local communities with knowledge and connection to the global communities.